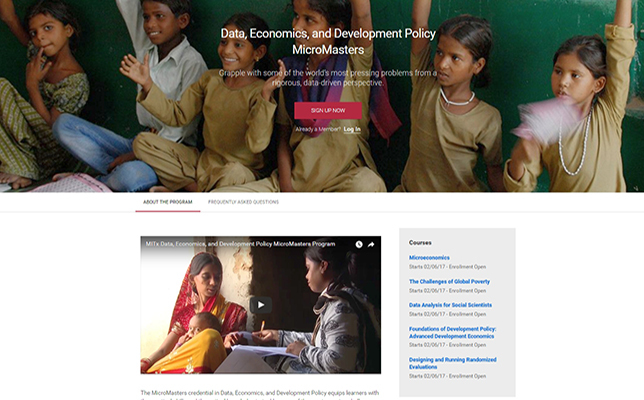 MIT, the same institution that produced one of this year's Nobel prize winners in economics, has introduced a new blended "micromasters" program that can help people earn their master's degree in data, economics and development policy (DEDP). It starts by attending and passing five massive, open, online courses (MOOCs) presented through MIT's edX platform, MITx. Those online classes may be audited for free, like any other MITx course. Or for students interested in pursuing the master's degree, they may pay course fees and pass proctored exams to be eligible to apply for admittance into the DEDP program. Each online course fee is between $100 and $1000, varying depending on the student's ability to pay. Those who pay for course access receive additional support from MIT teaching assistants and other features unavailable to people auditing the course. Students who have already passed any of the MIT MOOC classes that make up the online portion of the program don't have to repeat them; they simply have to pay the course fee and pass the exam. The institute also said students who can't pay immediately can still audit the courses and then pay the fees later in the process, before they take the proctored exams or apply for the master's program. The disadvantage is that they won't be able to access the extra help provided to the paying students. Those accepted into the DEDP master's program then spend a semester in residence at MIT, where they'll complete four classes in microeconomics, development economics, econometrics and an elective, and attend a lunch seminar to discuss policy issues and research topics. After that semester, students will complete a capstone project during the summer months, consisting of an internship in which they're expected to apply the knowledge gained during the program and produce a report on their internship project. According to MIT, that entire process is expected to take about half a year. The online courses are all scheduled to begin on February 6, 2017 and are currently open for registration. Each runs for 12 weeks and is expected to require about 12 hours of work a week. Although it's conceivable for a student to get through all five classes in three months, the school said it was more likely that participants would work at their own speed over many months. "Policy makers, NGO activists, businesspeople and in-development countries are increasingly aware of the importance of good data and rigorous evidence for designing and choosing policies and projects — and implementing them effectively," said Esther Duflo, a professor in MIT's Department of Economics and an instructor in the MOOC, "Foundations of Development Policy: Advanced Development Economics," in a prepared statement. "To become good producers and consumers of evidence, they need staff with a strong quantitative and analytical background. Today, few programs provide such training, and the available options are expensive and time-consuming. The blended master's in DEDP, anchored at MIT, the home of J-PAL, is an ideal solution to this challenge." J-PAL refers to the Abdul Latif Jameel Poverty Action Lab located at MIT, which is working on research on how to reduce poverty. The institute first experimented with its micro-masters approach in 2015, when it launched a credential in supply chain management that could lead to a master's degree. Since then, additional schools have introduced their own micro-masters programs in other disciplines, also hosted on edX. MIT has been the home of this year's Nobel Prize winner, Bengt Holmstrom, since 1994. Holmstrom, along with Harvard University's Oliver Hart, was recognized for work in contract theory.